As RideKC introduces 38 new modern, WiFi-equipped buses in Kansas City, disposing of the buses they replace presents a challenge. 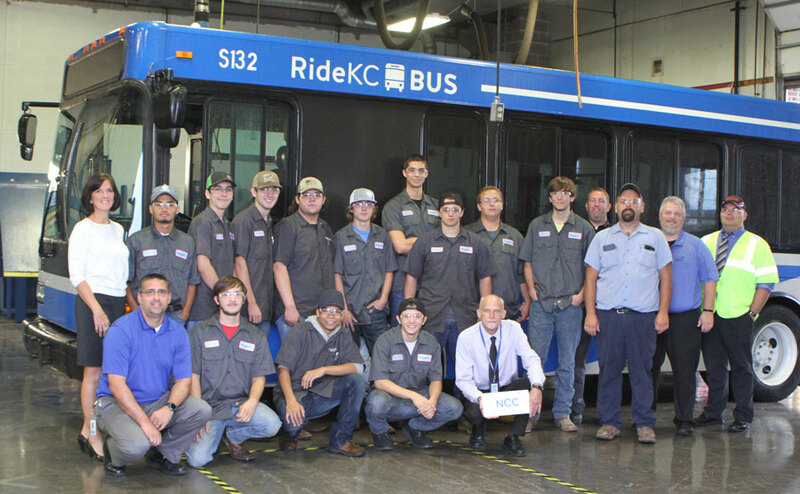 Last week, RideKC made a special delivery to the Northland Career Center (NCC) in Platte City, Mo. One of the retired buses will become part of the Diesel Technology program, which prepares high school students for an entry-level Diesel Technician position. As students filed into the garage to examine the bus, there were exclamations of “Wow!” and “Awesome!” The group is looking forward to working on the Gillig bus and learning new skills. 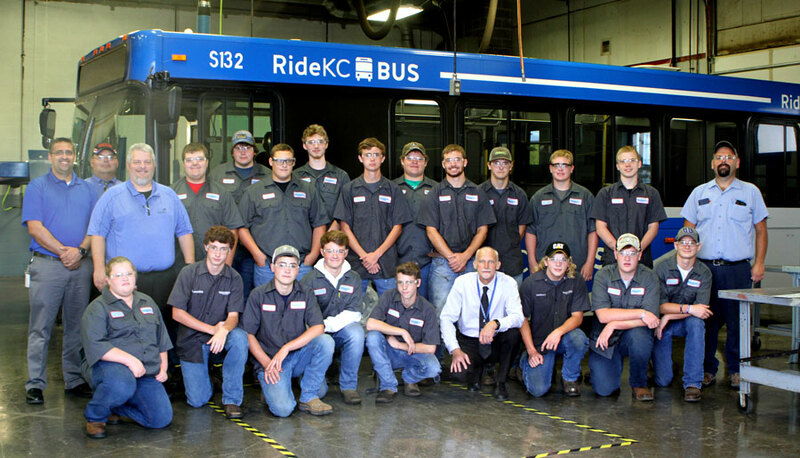 While this donation will benefit the school, KCATA is interested in making sure future mechanics in the KC area are well-trained and introduced to careers in public transportation. In fact, one of the Maintenance managers who helped deliver the retired bus started his diesel mechanic training at NCC. Locally, another bus was donated to Metropolitan Community College – Maple Woods’ Diesel Program. While a few buses will stay in the Kansas City area, most vehicles are being shared with some smaller transit agencies. Donating the buses, or selling at a very, very low price, often makes the most financial sense. Preparing buses for auction takes a substantial number of hours from our Maintenance department. The labor cost could lead to a loss of money at the auction. 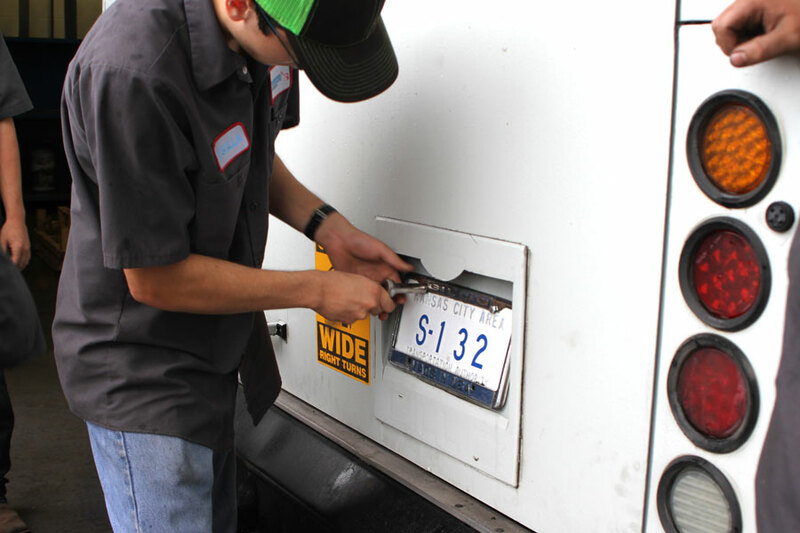 Above: The first task for the students was to replace the license plate. In addition to the donations to local school, KCATA donated six buses to Norman, Okla., four buses to Pueblo, Co., and ten buses to Jackson, Miss. Each agency reached out to Stambaugh about the donation when they heard we had some buses ready for retirement. These agencies were chosen because they are smaller transit agencies who do not have funding for purchasing new vehicles. “Our agency, especially our Maintenance Department, has taken such great care of our equipment to the point where, at the time of retirement, we are able to send the buses to other agencies,” Stambaugh said. 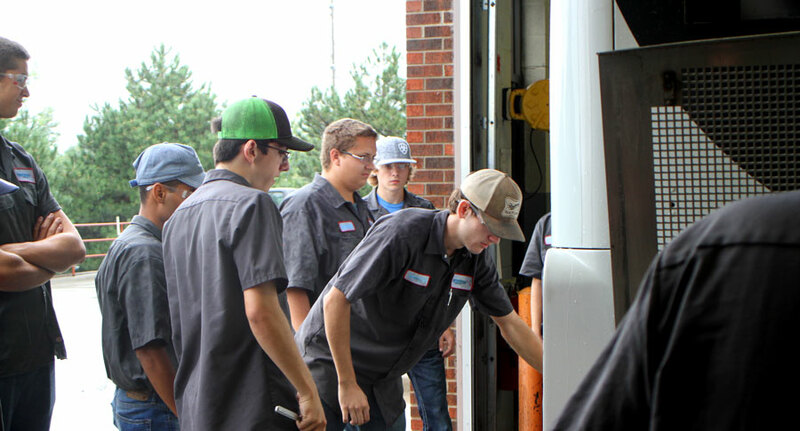 Students from several Northland schools participate in the Diesel Technology program. Above is the the morning class. Above: Students were anxious to take a look under the hood. Below: Students pose inside the bus. All seats have been removed from the vehicle.